Sheriff Slape sworn in as President of the Arkansas Sheriff's Association. 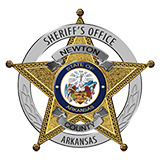 Sheriff Slape was sworn in as President of the Arkansas Sheriff's Association on Thursday July 7, 2016. The term will be for 1 year.